iPad has a music app for you, whether you want to make your own music, create mixes, or figure out who sang the song that’s playing. iPad even have apps that will play music you’ve never heard before but will probably like, all based on artists you input. 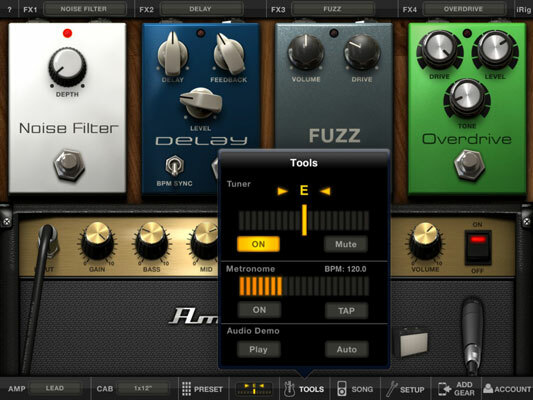 AmpliTube for iPad is a guitar amp and stomp boxes in an app. If you don’t play the guitar, skip this app. AmpliTube is for the guitar geeks. Think of it as a soundproof practice studio that goes anywhere your iPad goes. Plug in your guitar and earphones and your guitar sounds like you’re playing through a huge amp and massive speaker cabinet. You can even play guitar along with any song in the iTunes Library on your iPad. And you can adjust the volume of the song to hear more or less of your guitar shredding. You need an adapter like the AmpliTube iRig ($39.99) or GuitarConnect Cable ($29.99) from Griffin Technology. These handy gadgets let you connect both your guitar and your earphones to the iPad, making it possible to jam out. If you fancy yourself a DJ, freestyle rapper, hip-hop producer, or just someone who likes to create dance/hip-hop/rap beats on the fly, GrooveMaker Free is a superb app that lets you do it right on your iPad. GrooveMaker Free gives you two free “songs,” which in GrooveMaker parlance are remixable groups of audio loops that sound good together. If you tap any of the four Mix buttons on the right side of the screen — Random (D), Inst (C), Perc (B), and Mild (A) — GrooveMaker generates a new mix in the chosen genre by changing the loop(s) on one or more of the tracks. 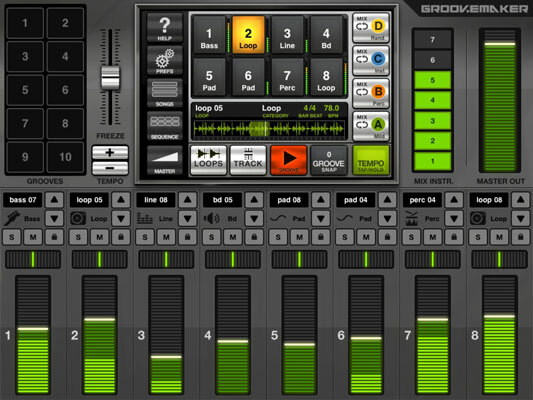 Each time you tap any of the mix buttons, you get an entirely new blend of loops. 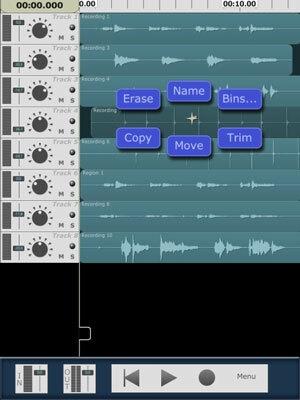 MultiTrack DAW (for Digital Audio Workstation) is an iPad app that records and mixes up to eight tracks of audio and costs less than ten bucks. It captures really-good-quality audio on up to eight tracks with very little fuss or bother. And you can listen to up to seven tracks you’ve recorded already while you’re recording on the eighth track, with nary a complaint from your iPad. It works — but the app offers no on-board effects such as echo, a compressor, an equalizer, or other niceties. You can finish the song on your Mac or PC, if you want. MultiTrack DAW has a built-in Wi-Fi server, so you can transfer the tracks. In a nutshell, Aphonium generates beautiful animated graphics that match the music generated by either the app’s artificial-intelligence engine or your fingers on the touch screen. To enjoy Aphonium, put on your earphones, pick a scene and a mood, and start tapping on and dragging your finger around the screen. Aphonium has three different “scenes,” as its modes are called. The Immerse scene lets you and gravity interact with shapes that move around on the screen. The Compose scene, shown in this figure, draws shapes and plays instruments when you tap. And the Conduct scene lets you control what you see and hear by dragging or tapping. Bloom HD is one part musical instrument, one part ambient music generator, and one part music-derived art. In its interactive play mode, you tap your iPhone screen to create elaborate musical patterns and melodies that are paired with colorful patterns of dots. Each tap produces notes that sound like a combination of 19th-century music box, grand piano, and Fender Rhodes electric piano. The three join to sing in unison while random synthesized chords play softly in the background. 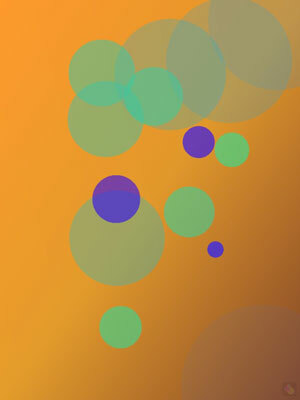 Think of Bloom HD as an infinite kaleidoscope with an ambient soundtrack created by Brian Eno. Bloom HD has myriad settings you can tinker with to subtly alter what you see and hear. 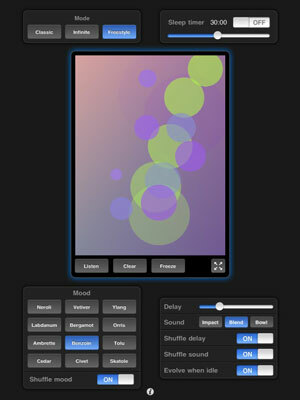 The app includes a dozen “moods” — preset combinations of colors and sounds — to choose from. Songwriter’s Pad is a great tool for writing songs and poems on your iPad. Choosing words and phrases delineated in emotional categories such as love, hate, happy, anger, and fear, can feel kind of sappy. And some of the phrases supplied to fire your imagination may tickle your funny bone instead. But . . . if phrases like “you ripped my heart out” and “you must be off your rocker” get your creative juices flowing, just wait until you check out the way-cool rhyming dictionary and thesaurus. Bebot is a clever app that’s part robot and part polyphonic musical synthesizer. When you touch the screen, the robot moves and makes different sounds controlled by your finger movements. With four-finger multitouch polyphony, multiple synthesis modes, user-definable presets and scales, adjustable synth settings and effects — and more — Bebot is sophisticated but still simple enough for anyone to use and enjoy. ImproVox refers to itself as “a new vocal instrument,” and that’s an apt description. While you sing, you move your fingers on the two touchpads on the screen. One touchpad corrects the pitch of your voice while it generates real-time four-part harmonies in five styles — choral, pop, barbershop, jazz, and baroque. The second touchpad governs vocal effects such as reverb, echo, flanger, and auto-wah. 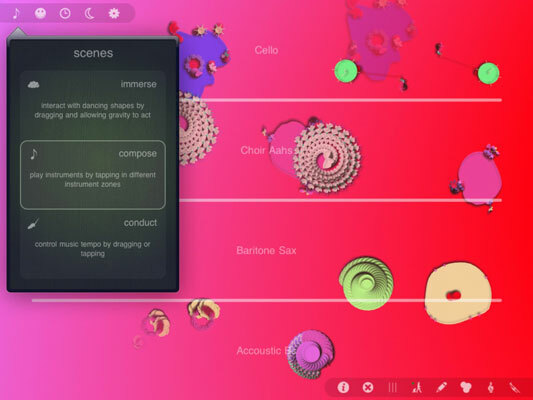 Seline HD is one of the first musical-instrument apps that approaches the iPad as a completely new medium for music. It uses an interface called ioGrid that was designed from the ground up for the iPad — in other words, this isn’t a digital conversion of an analog instrument. The app generates droning backing tracks while you play melodies, and it has two effects, 20 main instrument voices (plus nine drone voices), and you can record what you play!